I received the album promptly and scheduled it for some late night listening and a full review session the following day. The album had me at late night. And while this wonderful record was playing, I checked out the back cover. I discovered some serious vinyl and analog shenanigans going on. The LP was recorded live to 1/2 inch, two track analog tape at 30” per second and was mastered and cut directly from the analog tape by no less than the master himself, Bernie Grundman. The quality shows in the artwork, the gentle and tactile recording quality and the mastery of the performances from all four players (no edits or overdubs on the album). The repertoire doesn’t swing and it’s not progressive like, say, Anthony Braxton or Eric Dolphy—it flows, the rhythms undulate, and the melodies follow a free form style that are tonal and modal. As such, the heads sound intriguing and when hitting the form, both soloists are superb. There are frenetic moments, for sure—‘Chaos Reigns’—and the general style is most definitely not soporific, but as I was listening, my casual stance changed to one of deep concentration as the unique charts wove their magic. 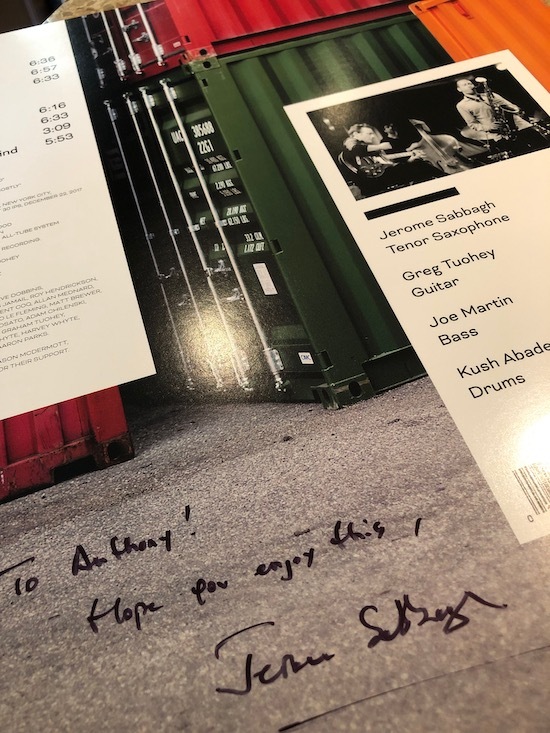 Sabbagh’s charts are excellent (the lead track ‘Vicious’ is especially strong with its use of ostinato) but I really liked the rhapsodic and wistful charts from Kiwi born, Berklee-trained guitarist Tuohey (leading a double life as rocker and jazzer; hey, a gig’s a gig! ), especially ‘Lurker’ and ‘No Road’. The recording models the repertoire. At first, I thought a little too reticent, maybe? But, no, the recording’s a peach (engineered by James Farber at Sear Sound, NY) with great detail but most definitely in the analog domain—just as I was thinking the bass and drums were a little far back in the mix, out pops a drum stroke or bass note in uncanny realism. You will not mistake this as a digital recording. That said, Sabbagh does offer a sleeve card insert with instructions on how to download the equivalent tracks in Hi Res digital files. This gem of a limited edition record is available at Sabbagh’s website. It’ll make a great addition to your vinyl library. Highly recommended.